When I was at the Epic Expo last week, I met a lovely woman at the Green Chair – Events with a conscience– booth. She asked if I would share a tip on camera while sitting in her bright green chair. 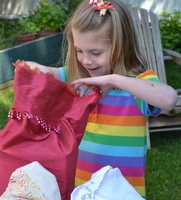 I talked about how at partygreen celebrations we provide cloth bags that I have made (sometimes with vintage fabric) so that children bring an unwrapped gift which they can use to “wrap” their present in. The birthday child “unwraps” their gifts and we take the bags with us when we leave the event along with all the other cloth decorations that I have made and used. In other words, there is zero waste! No more trips to the dollar store for all that wrap and decorations only to throw it away at the end of the party! The guests also really love choosing which bag they want to use to wrap their special thing in- it really adds to the fun and surprise of giving. Here is a lovely picture featuring a child’s surprise at the gift inside one of my cloth bags. 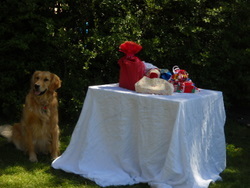 Here is a beautiful golden retriever “guarding” the gifts- luckily there is no food inside or she likely wouldn’t want to leave them alone!